Why can people not stop texting and driving? I spend a good amount of time on the road and I am continuously shocked by how many people are driving down the highway with both hands on their phone and their eyes staring squarely down at their phone. This, in spite of a massive campaign against distracted driving and a collective conscience which agrees this is a miserable idea. 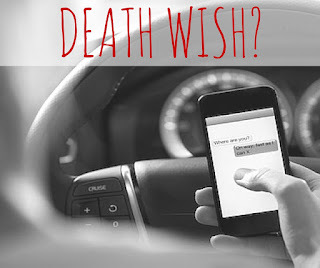 My guess is that most people either know someone who has been in an accident caused by distracted driving or they have been in one themselves. Yet an incredible amount of people continue to text and drive. Why? I cannot help but think this is the result of an overdeveloped need for immediate gratification and an unquenchable thirst for positive affirmation. Is it any surprise, then, that we cannot wait to check our cell phones. We want that message, and we want it now! Further, we’ve created in our children and in ourselves an affirmation addiction. We stopped declaring winners and losers in athletic contests because we wanted everyone to “feel” good about their performance. We are creating “safe spaces” at Universities for students who need to hide from challenging or frightening ideas. Remember when we used to say, “Sticks and stones may break my bones, but words can never hurt me.” We actually believed that was a true statement. Now it’s considered insensitive and hurtful. Only a cretan would be willing to admit they think it’s true. How do we stop texting and driving? The solution is NOT more billboards, commercials or school assemblies. Ironically, the solution will also not come quickly. All good things are worth waiting for, and most of the time, they require waiting. We must stop the gravy train. Nothing in life is free (despite what every political candidate tells us) and it’s that very lie which encourages our appetite for immediate gratification. Delay purchases. Choose contentment over accumulation. Say, “no” sometimes to your children (or at the very least say, “not now”). People who don’t text and drive have two characteristics. 1) They can wait to see what their phone has to say to them. 2) They don’t find their self-worth from a touchscreen. Maybe if we start there, we can fix the problem.